Children from all walks of life experience various emotions when their parent is in jail or prison, but they learn there are ways to communicate their feelings that will help improve their situation and remind them they are not alone. 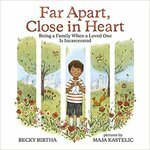 Birtha, Becky, "Far Apart, Close in Heart: Being a Family When a Loved One is Incarcerated" (2017). DIVerse Families. 857.